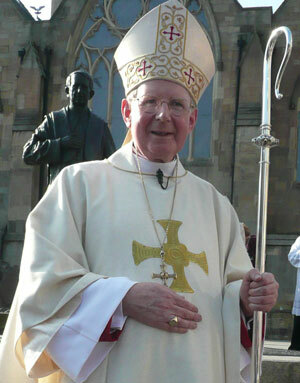 Bishop Emeritus Séamus Cunningham was ordained 13th Bishop of Hexham and Newcastle and installed in the Cathedral Church of St. Mary, Newcastle on 20 March 2009, the feast of St. Cuthbert, patron of the Diocese. Bishop Emeritus Séamus Cunningham was born on 7 July 1942 at Castlebar, Co. Mayo, Ireland, he was educated at local schools, which included St. Nathy’s College, Ballaghaderreen at which Bishop James Cunningham (1957-1974) had also been a student for a short time. Séamus Cunningham studied for the priesthood at St. John’s College, Waterford, where he was ordained priest for the Diocese of Hexham and Newcastle on 12 June 1966. He began as assistant priest in Our Lady and St. Joseph’s parish, Brooms in North West Durham, from September 1966 until August 1971. From 1971 – 1972 he was at English Martyrs, Newcastle upon Tyne. Then he spent one year, 1972 – 1973, at the new Corpus Christi College, London, preparing to begin work as a Diocesan Religious Education and Catechetics adviser, he returned to live and work in the Cathedral but also visited our schools throughout the Diocese. In 1978 he succeeded Father Leo Pyle as Director of Religious Education in the diocese and also as Chaplain to St. Mary’s Teaching Training College of the Sacred Heart of Education at Fenham. From 1984 to 1987 he spent three years as Spiritual Director to students for the priesthood at Ushaw College, Durham. In 1987 he returned to St. Mary’s Cathedral where he was to spend the next 10 years as Administrator and Parish Priest. He was appointed to the Chapter of Canons shortly afterwards. He moved to the parish of St. Oswin’s, Tynemouth and St. Mary’s, Cullercoats in 1998 after a short sabbatical in the States. Bishop Ambrose Griffiths appointed him one of four Vicars General in 2001. 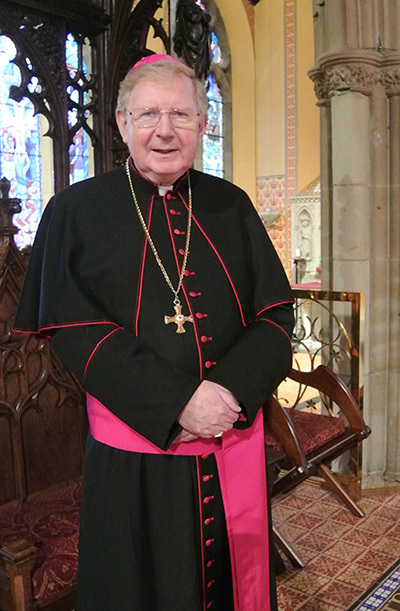 In 2004 Bishop Kevin Dunn appointed Canon Cunningham as the sole Vicar General. He held this post until the Bishop’s death on 1 March 2008. He was with Bishop Kevin and his family throughout Bishop Kevin's illness and death, and was elected Diocesan Administrator on 2 March 2008. He was ordained 13th Bishop of Hexham and Newcastle on 20 March 2009 by Liverpool’s Archbishop Patrick Kelly, Metropolitan of the Northern Province. He was appointed Apostolic Administrator for the Diocese by Pope Francis on Monday 4 February 2019 until his successor, Bishop Robert Byrne was installed as the 14th Bishop of Hexham and Newcastle on Monday 25 March 2019.